One of the most anticipated early movies of the 2017 season is easily the action sequel John Wick: Chapter 2. And it is bringing back the iconic Continental Hotel that fans remember from the first movie. Lionsgate has launched a new viral site for New Year's eve that revolves around this fine establishment for the international assassin. Set up as an online magazine, its first feature story is on hitman John Wick. 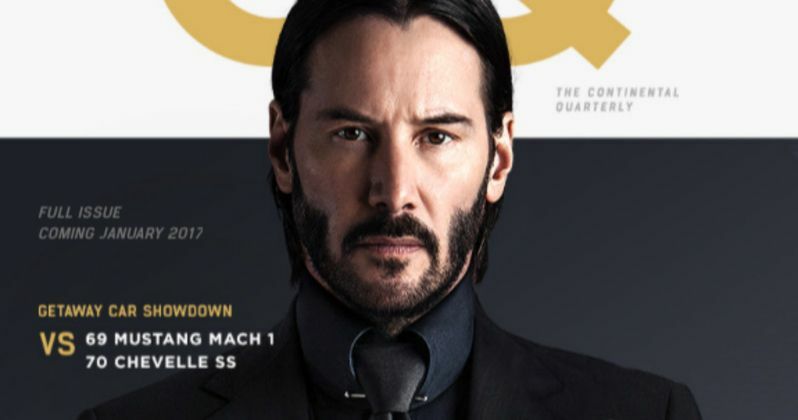 Keanu Reeves graces the cover of CQ: Continental Quarterly looking dapper as ever in his new assassin suit of armor, which is one very nice, perfectly tailored charcoal grey suit. The full CQ issue will be released in January, 2017. Featured stories will include Getaway Car Showdown, which pits a 69 Mustang Mach 1 against a 70 Chevelle SS. There is a fitness profile on Wick's killer workout routine. And another piece looks at man's best friend, as it offers a list of the best dogs for the lone wolf. But the center piece of this winter issue focus on John Wick, the man, the myth, the legend. You can check it out at ContinentalQuarterly.com. Here is the letter from the editor. "When most people think of the word 'Assassin', they picture a faceless animal, with no regard for the finer things in life. But we know better. We know the trade is among the most refined in the word today. Our discerning members demand the finest tailors and fashion designers. They drink at lounges with the extensive spirits lists and master sommeliers. They are the best at what they do and they deserve nothing less. At Continental Quarterly, our editorial staff prides itself on helping them make the most of the Continental's many amenities. In this issue, you'll find a range of articles on subjects of interest to top assassins and those who hire them. We'll look at the emergence of tactical fabric, the intelligent choices around classic auto restoration vs. modification, and updates and interviews with some leading lights of the trade, including Baba Yaga himself, the legendary John Wick. So relax and enjoy, a new issue is right around the corner." Keanu Reeves returns in the sequel to the 2014 hit as legendary hitman John Wick who is forced to back out of retirement by a former associate plotting to seize control of a shadowy international assassins' guild. Bound by a blood oath to help him, John travels to Rome where he squares off against some of the world's deadliest killers. John Wick: Chapter 2 is bringing back Winston (Ian McShane), Charon (Lance Reddick), Helen Wick (Bridget Moynahan), and Aurelio (John Leguizamo). New characters include The Bowery King (Laurence Fishburn) and actors Common, Ruby Rose, and Peter Stormare in as yet unnamed, yet deadly, roles. While we await the first issue of CQ in January, followed by the film's release in February, just in time for Valentine's Day, take a look at Keanu on the cover.